Boy, talk about a relic… The Software Bomb is what can only be described as a very early computer espionage novel. 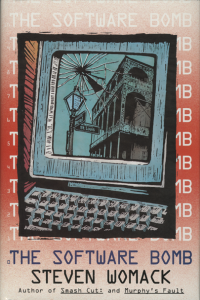 The third and final installment in the Jack Lynch trilogy, The Software Bomb was set during an era when a 2400-baud telephone modem was high speed internet, and you could find mass media storage for computer data, but a 10-megabyte hard drive was going to cost you six figures. If Fred Astaire had been born with two left feet, and bad acne to boot, he would have looked exactly like Martin Brown. Then there’s Trevenia Royale, the impoverished yet still seductive daughter of a once-prominent-and-well-off Louisiana family. Now a widow, Trevenia’s taken to living in a shotgun house on Freret Street where she lures young Tulane undergraduates into her house and has her way with them. One night, Martin Brown is generating bank statements in the basement IT department at the bank where Jack Lynch used to work… The next morning, Trevenia Royale opens her bank statement to find a quarter-million dollar jackpot. Chaos ensues. There’s a hacker who’s planted a “software bomb” in the bank’s computers and he’s going to set it off if the ransom isn’t paid. Enter Jack Lynch–still depressed and a hot-mess train wreck–who’s just come back to New Orleans after sitting with his dying mother in Southern California. His old boss offers him a freelance p.r. assignment–do everything possible to make sure the news of this cyber-extortion attempt doesn’t get out. In the end, Jack is not only successful, but manages to turn his life around. He heals from the damage of the last two novels and manages to find some peace. His story has resolved itself finally, and it was time for me as a writer to let go of him. By the time The Software Bomb was published, I’d begun my six-book long adventure with Harry James Denton. Dated computer references aside, The Software Bomb is a fun book and has more smart-assed humor than any of the other Jack Lynch tales.